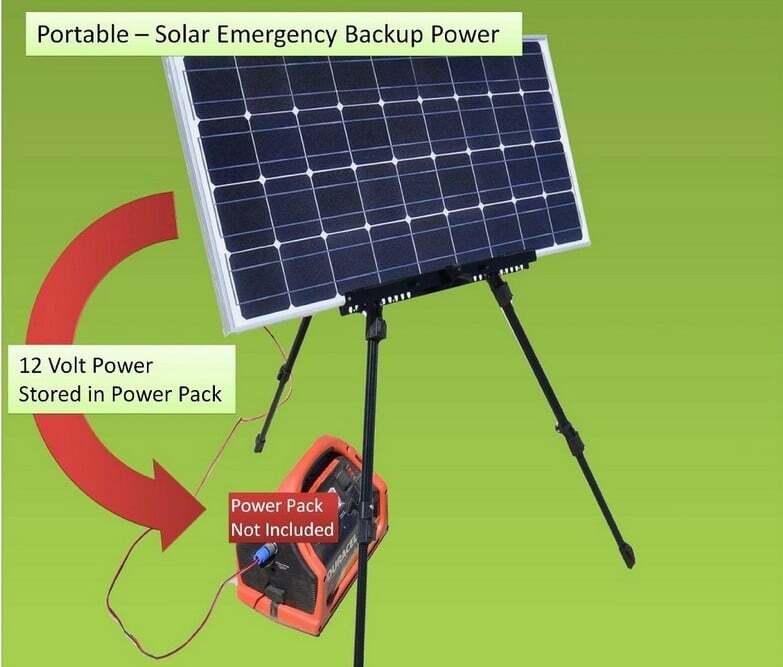 You may think that a simple solar charger would be just enough for your camping or hiking trip, but if you get to know that a portable solar generator can power all your mobile devices, gadgets and even laptops, you may consider such a solar generator for your next trip. Usually solar generators are heavier than ordinary solar chargers, because they turn the solar energy into powerful electric current which can charge a wider range of devices. You can’t charge a laptop with a much weaker solar charger. In this article we will present to you the best portable solar generators we found currently available on the market. Some of them are more suitable for car camping, others can be brought along with you even if you’re backpacking. While even the lightest version is heavier compared to a regular solar charger, it is still worth considering. This is especially true if you’re a photographer and need to power a camera, shoot time-lapses, keep a laptop charged at all times, etc. For the regular hiker or trekker, solar chargers would probably be enough. So, here is our list with the best portable solar generators. 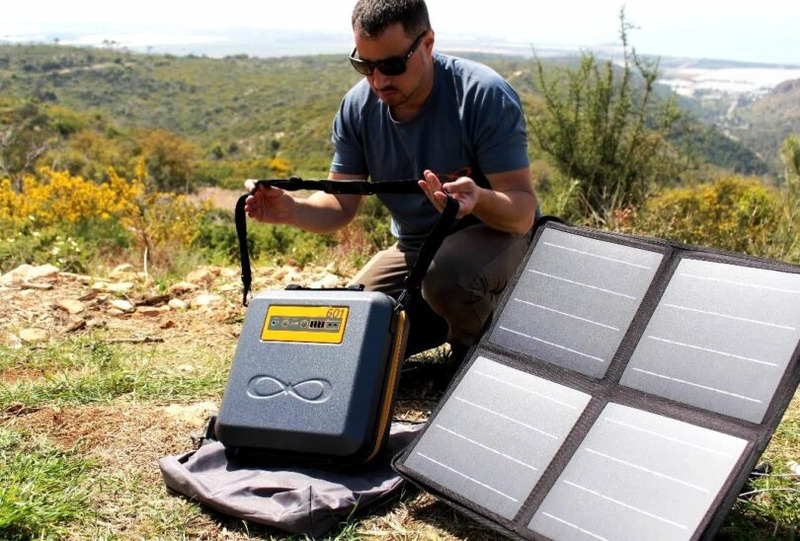 This solar generator is among the lightest we could find, with its 12 pounds (5.4kg). As we already mentioned, it can power up all types of electric and electronic devices, like laptops, smartphones, lamps (lights), DSLR, cameras, tablets, etc. and has an AC inverter. In case you can’t charge the generator from the sun, you can do so, by just plugging it in a wall socket. The handle is retractable and can pop-up whenever you need it to. In the remaining time, it can be kept compact, so that you won’t even notice it. There are 2 USB outlets, a 12-volt output socket, the AC inverter is 80 watts. You can power the generator in three ways – solar, wall socket (use the AC inverter) and with the 12-volt port. To solar charge the generator, plug in solar panels to it, and expose the panels to about 17 hours of sun. This can fully charge a laptop. According to some customers a single 20-watt solar panel isn’t enough if you really need to rely on the energy the generator produces. Some people tend to purchase two 20-watt solar panels to compensate the weaker single panel. This is of course optional. Otherwise, there is no issue so far found along with the generator. According to most customers everything works as expected and as advertised. We should point out that this is an entry-level solar generator and is ideal for beginners. Overall, most people use it for camping or keep it stored in case of an emergency situation. It’s a great product and most people are very happy with it. This generator is different from the above in several ways. First, you have 2 built-in solar panels, each providing 10 watts, plus a 10A charge controller, and a powerful inverter – 150 watts. The entire generator is indeed very powerful with its 175Wh. Also, it’s built in a way that is compact and comfortable to carry. It’s made in the shape of a suitcase with a handle, so that whenever you go out and open it, it will immediately begin charging the generator battery. There’s also an LED flash light, which has even an SOS mode. The entire generator is slightly less heavy than the Yeti model – it weighs about 10 pounds (4.5kg). The 16Ah lithium polymer battery is carefully sealed in a water-proof casing. This generator kit is ideal for campers and even backpackers who need a compact all-in-one portable way to charge their devices. 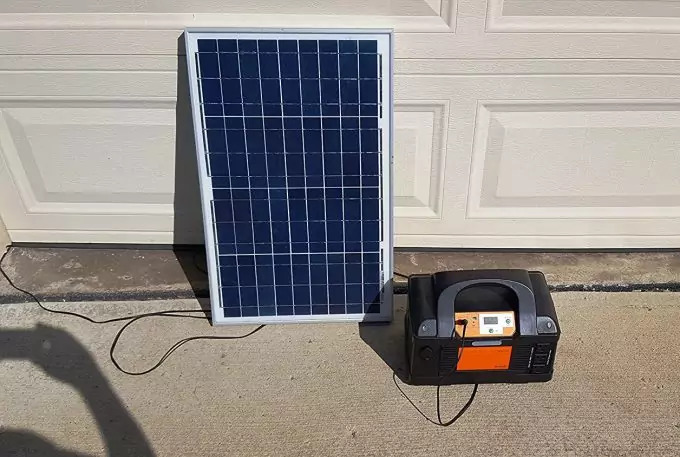 One of the really invaluable things about this generator is that you can plug in additional solar panels, so that the total capacity would reach 50W. When it comes to what customers have experienced with this generator, most of them are extremely happy and surprised at the rugged design, that shows not only a great functionality but also a thorough craftsmanship and an eye for detail. Some of them have even purchased a second such unit, just because it works great and people decide to use them in various activities (mostly outdoors) and at home in case a disaster strikes. Overall, it’s a great product for the price, and every penny is worth the quality you get. 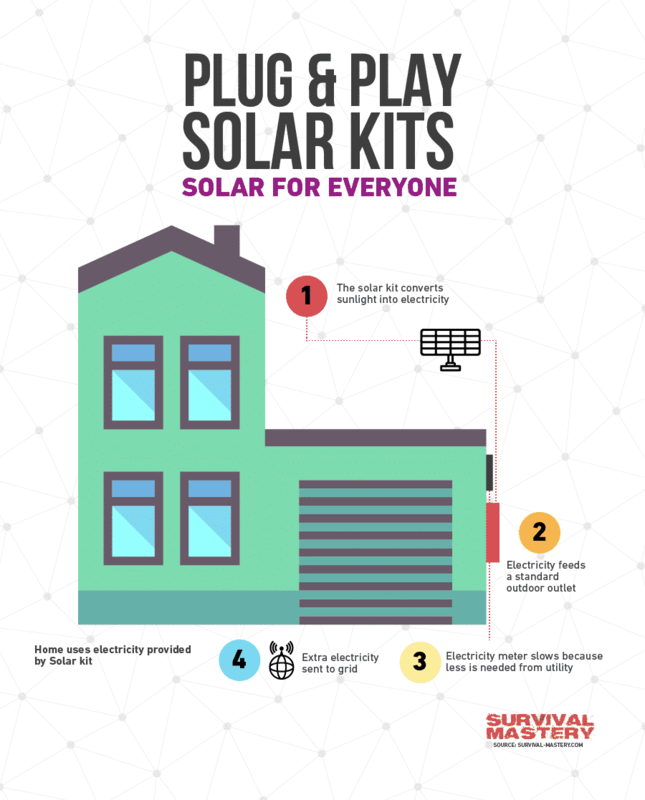 This solar generator kit can be successfully powered and charged entirely by daylight. This is great since you may not have direct sunlight every day. This means that, whenever it’s daytime, you can count on the generator to power the batteries. It may not be as powerful as it could be with direct sunlight, but it produces powerful enough energy. The Wagan generator is among the best so far, because its power outlets produce a total of 300W. The solar panel (which is also weatherproof, and can withstand any type of harsh weather, including hail) is more powerful than the above – 30W. Also, it’s better because its cells are poly-crystalline (unlike the more wide-spread mono-crystalline). This makes it more durable and efficient. While this solar generator kit is heavier more than double in comparison to the above products, it is much more powerful and reliable. As the name implies, you simply plug in the solar panel to the battery-pack, and it will immediately begin to charge. The solar panel cable is 25 ft (7.62 m) which means you can set the solar panel to a sunny spot, but keep your gadgets, devices, laptops and cameras to the shade, next to you. Another great feature is that you won’t ever need a charge controller, because the battery has a ‘trickle charge’ mode, which sets in when the battery is fully charged. This will protect the battery from overcharging. 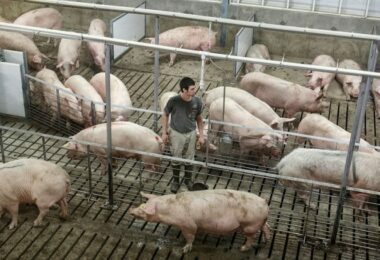 Most customers are very happy with the product and purchase a second unit. Some tend to experience short-lived battery, and this may be a slight concern. For most customers the battery lasts 3 to 5 years until it needs to be replaced with a new one. Being among the heaviest portable solar generators, it is considered also one of the best available on the market. The photovoltaic cells are 195W, and the 2-part system is 12V. The solar panel cable is also 25 ft (7.62 m), just like the Wagan model. The cabinet, where you install the generator, is weather-proof and the installation itself is easy to do. The cabinet also ships with wheels, since due to its weight you need to transport it easily from one place to another. Thanks to the wheels that’s no problem at all. 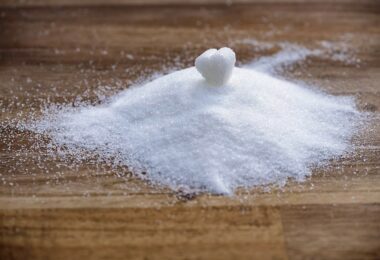 When mentioned only for a while the weight. While the generator is still considered portable, it’s much bulkier and heavy with its 120 lbs/54 kg. The total weight of the entire kit is 163 lbs/74 kg. Due to its weight you may only be able to go camping with it in case you’re in a van. Otherwise, it’s ideal for powering your apartment or house, without the need to move it too much. It has wheels as we said, so it is portable. And because it uses natural energy (solar) it’s clean and can be kept inside, without any risk for exhaust fumes or any dangerous gas leakage. The plug-and-play connectors are very easy to attach and detach, minimizing the risk for short circuitry, thus increasing the safety levels of this generator. What you may find unique about this product is the instructions manual. It is written with a clear language and you understand every step easily. Most customers complete the setup within 30 minutes. Another thing which you may find unique, is that, if you call Grid Eraser for some help you will talk immediately with the owner, David. 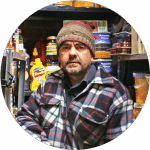 He is very open to help you and navigate you through the issue you may have, or to simply instruct you on the installation (in case you have troubles with it), etc. The customer support, in the face of David, is top-notch. All customers who had the chance to talk to him are more than pleased. You can’t go wrong by purchasing this heavy-duty solar generator. This large solar generator has the most amount of solar panels (it has 5), and comes with the ability to plug in more solar panels, so as to increase the total wattage produced. Each built-in solar panel provides 16 W of energy. The AC inverter can provide up to 1500 watts. There are 2 AC outlets, which can be used to charge a wide range of appliances and devices, from radio, television set, laptops, computers, mobile devices, and even larger kitchen appliances like a fridge and a microwave. There are of course 2 USB ports for your electronic devices like iPads, iPhones, mp3 players, etc. The great thing about this generator is that it is ready to use, once you do the setup. Basically it’s an all-in-one plug-n-play generator and can only be expanded with more solar panels for your convenience and more energy output. The generator has a collapsible handle, to make it easy to transport. The built-in solar panels can be retracted into the generator, thus, when you get it from your dealer, you will see a luggage-sized unit, which can expand nearly double to catch the sun’s energy. The AC inverter can maintain a whopping 3600 watts of surge. It’s a powerful generator unit, and weighs much less than the Grid Eraser unit – 101lbs. To begin using it, you first need to charge it for 24 hours. This is the initial charge. After that, it’s best to keep the battery to no less than 50%. Thus you will prolong its life. Otherwise, as long as you keep the solar generator exposed to day light or direct sunlight, your batteries will remain topped up almost all the time. Keep in mind that if you use heavy appliances like a refrigerator or a microwave, you shouldn’t have them run simultaneously. Have only one of these run, while the other is plugged off from the generator. All in all, customers are pleased and happy to use Wagan’s generator, and plan on expanding it with more solar panels. It’s a great product offered at a competitive price. Because of the relatively low price of this unit, you shouldn’t expect a huge power surge, as with the Wagan’s unit. This one provides you with 85W, and is compatible with other 12v charging systems. The greatest things about this product is that it doesn’t weigh so much as some of the above units. It’s about 40 lbs/18 kg. It is also optimized for more solar panels and can thus be expanded to receive more solar energy and power up more of your devices at a time. Another noteworthy thing is that the setup is extremely easy and can take up no more than 10 minutes of your time. The steps are easy to follow and execute. The manual is understandable and clear to the point. The solar panels can be mounted on a tri-pod, which ships together with the solar generator. At first it may seem a bit clumsy and weird, but once you get used to it, it begins to make sense. Of course, strong wind may top off the tri-pod, but this hasn’t been reported by the customers so far. As a whole, it’s a great entry-level solar powered generator, as it delivers great quality and performance for the price you pay. 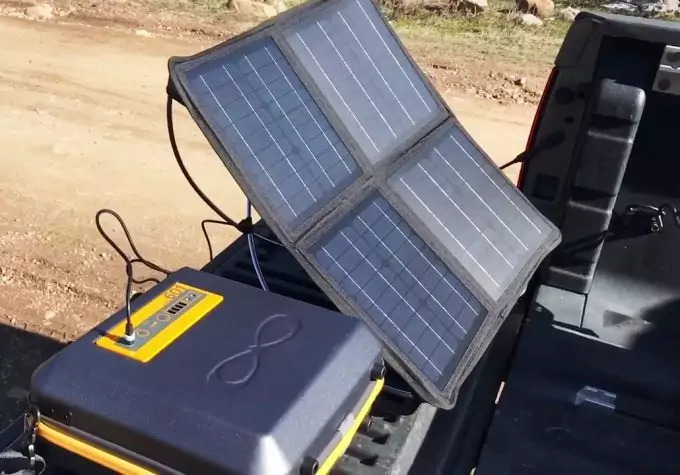 While this unit isn’t exactly a traditional solar generator, it still generates energy and can be used successfully with a variety of devices and gadgets. This is because it doesn’t have a battery set. The unit weighs much less than some of the above products. It’s about 60 lbs/27 kg. When you purchase this unit you will get an amorphous 15-watt solar panel cell, plus a powerful 200-watt sine wave inverter. On top of that, you’ll have a 7-Ampere solar charging regulator, plus all the wires you need for connecting everything you need. What’s really considered an advantage with this unit is that it’s a full-fledged stand-alone unit. For that matter, you can simply charge a 12V battery set, vehicles, and any other unit with a power storage capacity. Thanks to that, you can then use the stored power to charge any device or electronic gadget you need. This can all happen on a camping trip, or at home. 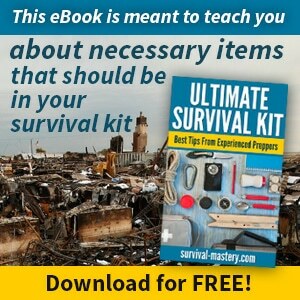 It’s ideal for recreational purposes, but it can be used, of course, for preparation for unexpected disaster situations. Another great thing is that it can successfully charge during cloudy or overcast weather. The unit is built with a strong reliable ABS plastic, which gives it stability and makes it a rugged durable product. This means that even a heavy hailstorm can’t damage the solar panel’s top layer. There’s also a built-in diode, which prevents the battery from discharging during the night, thus keeping the energy collected during the day safely stored for use on the next day. For the price of this unit, you won’t be disappointed. Most customers are very pleased with the functionality, portability and use of this unit, and recommend it. Considering the total wattage output of this solar panel and the price, we can say that this could be the best bargain for your pocket and your needs. It features 4 AC outlets, plus an integrated transfer switch and an AC charger. The plug-n-play setup is extremely easy and intuitive and can be done entirely be you within no more than one hour. Any additional solar panels you may want to add, can be attached to the KISAE generator. You can also purchase separate Auxiliary batteries. While it weighs nearly 76 pounds it is still not as heavy as Wagan’s or Grid Eraser’s generator units. Weight of course shouldn’t be a problem, but it depends on your purposes for this unit. Another thing to consider is that there is a fan which turns on when you plug the unit in. It could be slightly noisy, although insignificantly (no customer found that a problem), but we still have to point that out, in case you have sensitive hearing. Another slightly negative thing about the product is that there is somewhat a lack of customer service, responding quickly to your needs. In fact, many customers who had issues or questions for KISAE, tried to contact the customer service center, but couldn’t get through them. This can be definitely off-putting, but when it comes to the product itself, there were hardly any issues reported. This generator is ideal for camping and some light-duty use. All of the above products are among the best portable solar generator kits we found. All of them have different properties, which need to be taken into account before you commit to a purchase. Consider what you need this generator for, and weigh the pros and cons. A good advice is to always spend some time finding detailed customer reviews before you purchase anything. This is especially true for the above units, since they are overall expensive. Read our piece to find out how solar energy works to give you more information.